Hot on the heels of being designated a State Wildlife Corridor the previous year, in 2002 the River Park purchased or assisted in the purchase of three major properties in the river valley to be used for habitat conservation- the Helms (Proudfoot) property between Sutherland Reservoir and Santa Ysabel Open Space Preserve West, the Derbas property between Del Dios Highway and Elfin Forest Recreational Reserve, and Bernardo Mountain on the north shore of Lake Hodges. The 410 acre Helms property was purchased by the San Dieguito River Park JPA and is immediately adjacent to another SDRP-owned property and the County’s Santa Ysabel Open Space Preserve West. 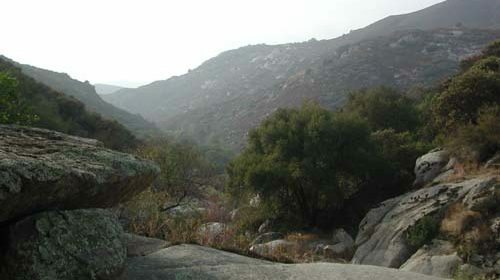 Santa Ysabel Creek cascades over large boulders through the middle of the property that SDRP now calls Santa Ysabel Gorge. A future segment of the Coast to Crest Trail will travel through these properties. The featured image is a view of the Helms property. The Derbas property was originally proposed to become the Montreux development of 84 mansions approved by the Escondido City Council. The property is home to the rare Encinitas baccharis shrub and a pair of nesting golden eagles. Luckily, as Adnan Derbas said in an interview with The San Diego Union-Tribune, “I am willing to sell the land for conservation purposes at a substantial discount.” The first 92 acre parcel of the 345 acre Derbas property was purchased by the County of San Diego in 2002, with the remaining 253 acres purchased by The Escondido Creek Conservancy. In 2003, the County purchased the 253 acres of land from TECC. The SDRP JPA Board allocated money to the County to help with the purchase of the Derbas property, which is now part of Del Dios Highlands Preserve. Bernardo Mountain was also planned for development in 2002. A combination of a state grant obtained by SDRP, a fundraising effort led by San Dieguito River Valley Conservancy and Palomar Audubon Society member William “Bill” Harbin, and a contribution from the City of Escondido led to the purchase of the 232 acre Bernardo Mountain. This land contains coastal sage scrub habitat that is home to threatened California gnatcatchers and possibly as few as the last 6 coastal cactus wrens in the Lake Hodges area.